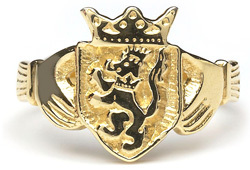 This ring is hand made to order with your family crest. To find out if we have your families coat of arms in our huge database system please feel free to call or email one of our friendly staff members anytime. If you know your family has a coat of arms simply put your name or names that you desire in the "Message" section of the final payment screen.